The Space Shuttle Endeavour prepares to rendezvous with the FGB. 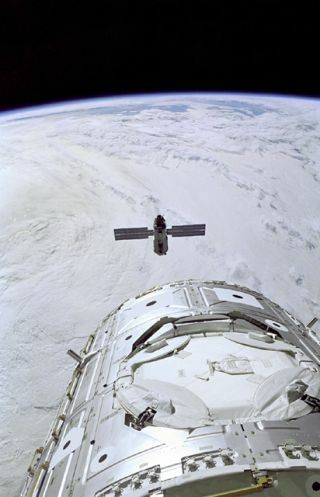 In this historical photo from the U.S. space agency, backdropped against a blanket of heavy cloud cover in December of 1998, the Russian-built FGB, also called Zarya, nears the Space Shuttle Endeavour and the U.S.-built Node 1, also called Unity (foreground). Inside Endeavour's cabin, the STS-88 crew readies the Remote Manipulator System (RMS) for Zarya capture as they await the carefully choreographed dance of the rendezvous.